Long’s goal – Shane Long deceives Jan Vertonghen in the air, and then dashes past him to get on the end of a pass from Nikica Jelavic (or an attempted clearance from Danny Rose! ), and beats Hugo Lloris. A long kick from goalkeeper, Steve Harper, is attacked by Jan Vertonghen and Shane Long. In committing himself to this, Vertonghen has pushed rather a long way up the pitch. Long seems to outmanoeuvre Vertonghen, lets the ball bounce, and is on his toes quickly. Danny Rose and Nikica Jelavic compete for the awkwardly bouncing ball, and it appears that it’s actually Rose who inadvertently hooks the ball on. 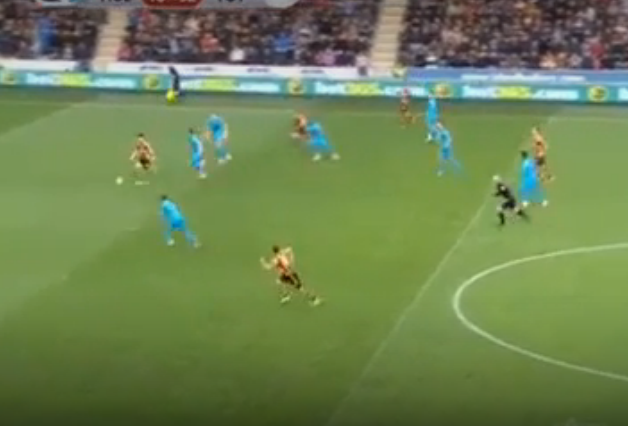 Note Dawson, having pushed up to cover for Vertonghen’s charge forward. Kyle Walker has not clocked the danger, and is caught on his heels. The accidental through-ball confuses everyone, and Long continues his run to burst through the centre of our defence. 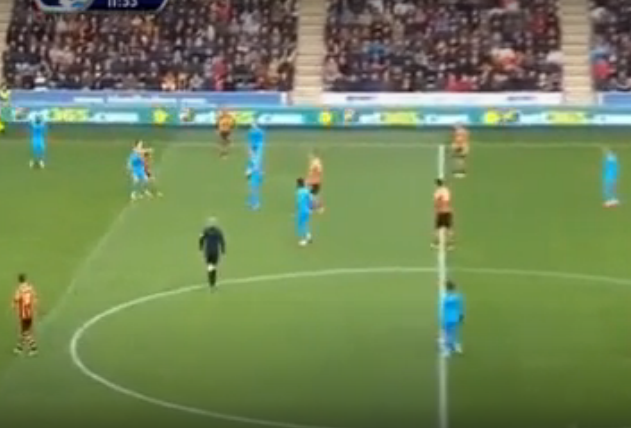 Walker’s delay in covering round means that he’s now got no chance of making it to the ball first. …and lifts the ball over Lloris. This was a very patchy performance from Spurs, where our passing was often sub-standard amidst lots of pressure from a highly motivated Hull side. Our central defenders in particular showed a lack of patience, and ended up with very low pass completion rates (Dawson 63%, Vertonghen 77%). The first half was particularly disappointing although Spurs improved significantly after the break. However, despite dominating possession, we didn’t trouble Hull’s defence enough, especially after getting our slightly fortuitous equaliser. Personally I felt that David Meyler should have seen red in the second – his first challenge on Bentaleb was a borderline red card in itself, but his second foul on the same player should certainly have seen him shown his second yellow rather than his first. Sherwood’s reluctance to use his substitutes was a real frustration. Aaron Lennon was largely woeful, often failing to show for the ball or get upfield to support his teammates, yet he was left on the pitch for the whole 90 minutes. Likewise, Soldado had a very disappointing match but was not replaced. A draw away at Hull – who beat Liverpool, and have only conceded 9 goals at home (the same number that Chelsea have conceded at Stamford Bridge) – is not the end of the world. But it did feel like the match was in our hands after we equalised, and Sherwood’s lack of action from the bench has left many questioning his ability to change a game. You forgot to mention that both forwards were offside from the goal kick. Watch it again from the aerial angle from the Spurs end. Both offside. I'm still puzzled as to why no one has picked up on this. Long is offside and although he doesn't play the ball, he attempts to (I believe he gets called on this later in the match). Nonetheless, the ball bounces to Jelavic, who also comes from an offside position, to flick the ball on to Long to race on and finish. Two offsides. You can't be offside from a goal kick! Paulinho was the worst player on the pitch. He may have scored, but the rest of the game he was anonymous. He was hit and miss - completed lots of passes and made lots of bursts forward, but didn't get on the ball as much as I'd like. Jellybitch may have been a yard offside, but again Walker fails to spot the danger as well as Dawson! Neither of these 2 are good enough for a team hoping to be champions!!! Walker's been our best player this season in my opinion, but I agree that he should have done better here. Walker is always getting caught out. He needs to learn to defend. I cant honestly think of too many times Walker has been caught out, the rooney goal possibly, but that seemed more a case of whatever part of the body you can and got unlucky. Anyway, the overall picture is that unlike last year we are not left with a lasting impression that Walker can be relied on to give up one goal a match. ...forgot to say I voted Hugo as our MOM, as he usuallyis the best player we have out there. What a shame he will be phukkin off at the end of this season!!!! Thought Hugo made a few risky decisions today as he has ever since the Lukaku incident (that's probably coincidence though!). Interesting idea Holtby at LB but why bother- bring back Bennyfrom QPR. We lost the odd goal but never shipped 5's and 6's with him and he often started moves- and a better effective attacker than Rose. Just saw the MOTD highlights, you can't possibly seriously blame Walker for that goal. If he can't expect the 3 other players to cover that ball without his help, he may as well give up with the team. If Spurs players continue to play with this style against other teams, there's no way they will be even Top 6. 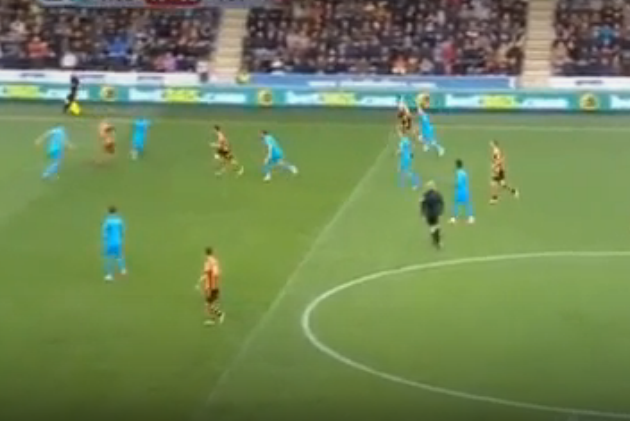 My analysis of some of the players in the match against Hull is as follows: Walker - has no clue how to defend & is not aware at all of the situation when Spurs is under attack. Passing ability is atrocious. Ericksen - Too greedy when he had the chance to pass to other players who would have had a better chance to score. Needs to learn to play for the team than playing for individual glory, as is happening with most other Spurs players. Soldado - down right hopeless & should never be fielded again as he's totally not the right type of forward Spurs needed. Lennon - Last 2 games clearly shows that he lacks confidence at times & needs to be replaced by those who are willing to make things happen. Bentaleb - still raw & the unfinished product. Don't understand why Sherwood does not play Capoue or another proven midfielder. Dawson & Vertonghen - need to establish better communications between each other. Paulinho - apart from the goal, he did not do anything significant. Overall Spurs do not play with any set of possible plans on how to tackle different teams based on their regular style & Sherwood does not have any ideas on when to field the right players & bring in the substitutions that can change the game. Walker cost us Champions League with THAT pass against Liverpool. I note that Windy did not comment on the City match: it looked like our midfield were imitating playground football. Walker is often lauded over Naughton, but I think the latter is the better defender. Sherwood's love of Bentaleb defies belief, especially his star is starting to wane. Sherwood's schtick is to play the best players in the correct positions and the rest will follow. However, he appears not to be following his own plan. Honestly, this season started with so much hope, but is becoming a complete Horlicks.